In the lead-up to last night’s finals in the League Champions Korea summer playoffs, Longzhu Gaming made it clear, in no uncertain terms, that any opponent should probably ban Jayce against them. Kim “Khan” Dong-ha, top lane player for Longzhu, boasted an 8-1 record on the transforming League of Legends champion during the summer season. He’s known, generally, for his Jayce play. In a post-game interview, he even advised opponents to just use one of their five bans to remove the option. “I honestly thought they were going to ban him,” said Kim. “Jayce is a champion that can make or break the game depending on the player piloting him. Well, I am very good with him, so I didn’t hesitate to pick him. So when SKT T1, coming off a tough summer slump to climb back up the playoff ladder and face Longzhu, got to the draft phase, the choice should have been clear, right? Game 1, SKT bans Jayce yet still loses when, among other factors, Kim’s Jax becomes too much for SKT to handle. In game 2, SKT reacted to Kim by opting to ban Jax and let Jayce through, leading to a loss at the hands of Kim’s excellent Jayce play. In game 3, they rectified this, banned Jayce, and won; but game 4 rolled around, Longzhu one point from victory, and SKT let it through. Why is Kim’s Jayce so intimidating? It’s a tricky hero to deal with, for one. 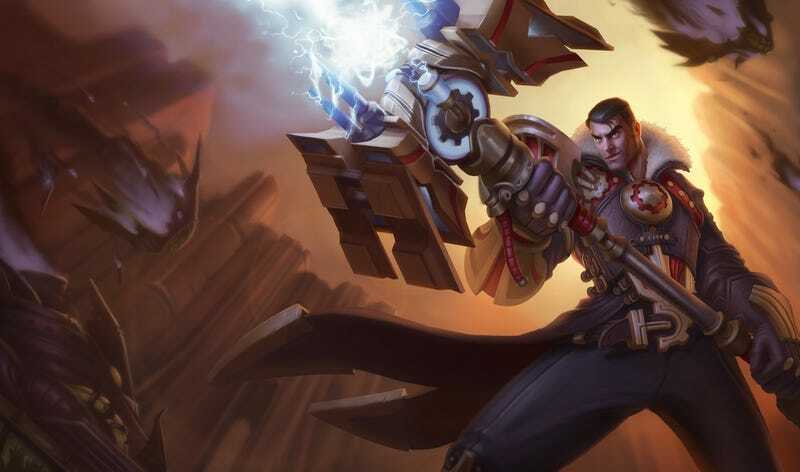 Jayce’s core is the ability to transform back and forth between two playstyles: Long-range poking and prodding, or in-your-face hammer swinging. In game 4, when Longzhu was pushing into SKT’s base, you can see the presence Kim’s play brings to a fight, and the knowledge he has on his hero of choice. Kim sits just outside SKT’s reach, shooting away at enemies. When SKT thinks they have him cornered and move in, Kim lets loose a series of volleys, firing off a shock blast before transforming and leaping at the team with his hammer. The damage he does is incredible, disrupting SKT’s counter-offensive and pushing them back into their base, where the rest of Longzhu was waiting to clean up. The series ends 3-1 in Longzhu’s favor, and Jayce ends the match having participated in 13 of the team’s 14 kills. It’s questionable whether SKT thought they might have an answer to the Jayce when they let it through, or they simply valued other bans, like Galio or Jax, to a greater degree. Either way, the two games Jayce slipped through were decisive, especially so in the final match of the series. Longzhu secures a ticket and 1st seed representing Korea in the 2017 League of Legends World Championship. SKT will also attend as the 2nd seed for their region, and if a rematch occurs, you can likely expect SKT to be more direct in their bans towards Kim.